Peterson Donegal Rocky Briar Pipe – Sterling Silver Shape 80s | Old Morris Tobacconist Victoria BC, Fine Cigars, Humidores and Tobacco Merchantile. Peterson pipes are made in Dublin Ireland, and feature a unique P-lip mouthpiece, designed to direct smoke upwards towards the roof of the mouth instead of the tongue. The result is a less biting smoke that allows the user to better enjoy the tobacco flavours for a drier, cooler experience. The Donegal Rocky Series is one of Peterson's most popular lines. 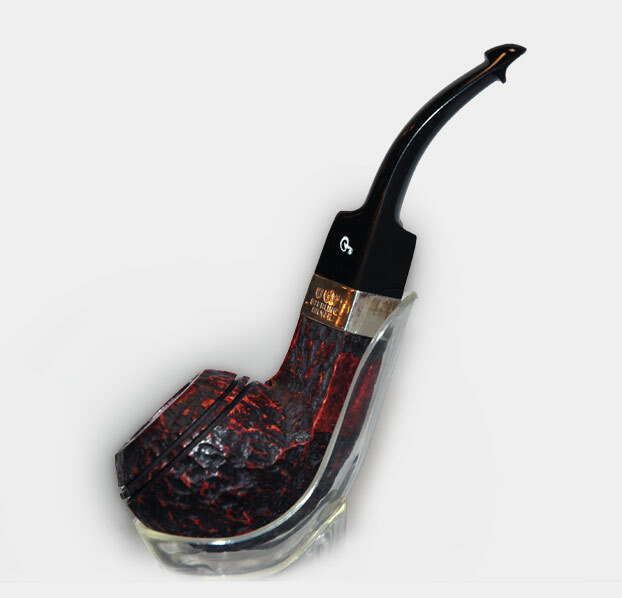 Known for its rusticated finish these pipes have an excellent balance of smokability and value. Over the years the design of the series has changed somewhat, and now the aged briar sports a two-tone cherry and black finish. The Donegal 80s features a sterling silver band, and a classic bulldog design with a diamond shank and a double-grooved bowl for cooling.